My inspiration came from the Antebellum period when women wore hop skirs, corsets, pantalets, gloves and wide-brimmed hats. Growing up reading and watching the Movie: Gone with the Wind, I was inspired by Scarlett O’Hara’s use of her curtains to make her dress to meet Rhett Butler. I thought, she should have had a fancy apron, in case he came by while she was in the kitchen! 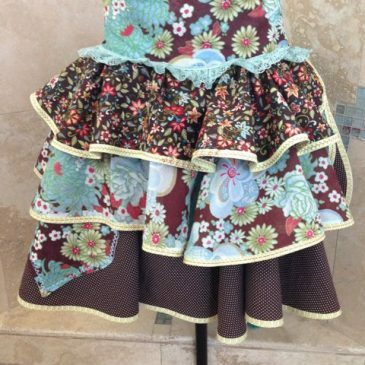 3 tier flirty 1/2 apron with biased tape with unusual stitching made this apron a delightful fancy. Featured in Apronology Magazine 2014, 2nd place San Diego Fair 2014 Sold!! !